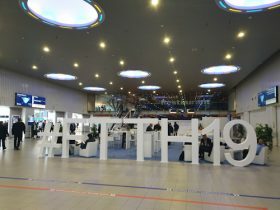 FTTH/B is growing fast in Europe, according to the latest Market Panorama and forecast data prepared by IDATE for the FTTH Conference 2019. The report reveals that by September 2018, there were more than 59.6 million FTTH/B subscribers in the European region, an increase of 21%, with overall coverage reaching 36.4%. While Italy has the higher growth in homes passed at 43.1%, for the first time, the UK entered the ranking. The report found that the number of FTTH/B subscribers increased by 15.7% in the top 39 European countries1 since September 2017 with more than 59.6 million FTTH/B subscribers in September 2018. 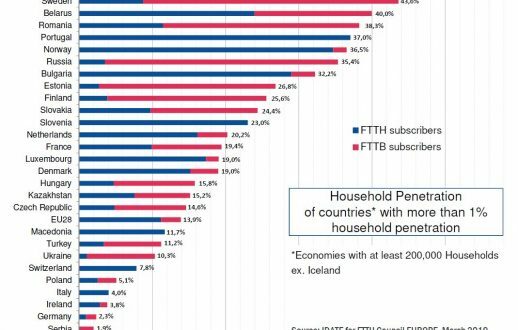 Although Russia, which is included in the group, leads in terms of FTTH/B subscribers in the European region, it has showed a lower growth rate compared to other European countries which are catching up quickly with a 21% growth rate. In addition, the deployment of both FTTH and FTTB networks has increased significantly, according to IDATE. It found that by September 2018 the estimated coverage2 of FTTH/B reached 46.4% in the 39 group and 36.4% in EU282, which does not include countries such as Russia. This, says IDATE, shows a clear upward trend from September 2015 where the estimated coverage rate was 39% in the EU39 and 27.2% in the EU28. In the year to September 2018, the country adding the most subscribers was Spain, which added 1,858,743 new FTTH/B subscribers, with France coming second with the addition of 1,480,220. Russia saw its FTTH/B subscriber base increase by 1,256,000 new FTTH/B customers. Other countries also experienced notable increases such as Czechia with 523,950 new subscribers and Italy with 449,637. Italy also saw almost two million more homes passed, from 4,398,435 in September 2017 to 6,295,000 in September 2018 for a total increase of 43.12%. The take-up rate elevated to 37.4% for EU39 from 34.8% the previous year with a take-up rate for EU28 (38.2%) surpassing the EU39 rate for the first time. Countries like Andorra, Belarus, Belgium, Latvia, Netherlands and Romania experienced a take-up rate surpassing 50%. Fibre technologies have evolved in recent years and by September 2018, there was a predominance of FTTH architecture over FTTB (56% vs 44%). In the European region, alternative players were the most involved in FTTH/B expansion, with a contribution of around 55% from the total FTTH/B players. Also, governments and local authorities are getting more involved in fibre projects, either directly, by signing agreements with telecom players, or via public funds. The report says it is also worth noting that incumbents in some countries have started to modify their strategy in order to deploy FTTH solutions, instead of continuing the development of legacy copper-based or cable-based networks. This year, the United Kingdom enters the global ranking for the first time, reaching a modest penetration rate of 1.3% and a take-up rate of 13.1%. FTTH/B subscriptions grew by 83% compared to September 2017 for a total of 369,250 subscribers, and FTTH/B homes passed rose to 22.8% reaching 2,817,000, although these figures are from a very low base. UK regulator, Ofcom has played a major role in promoting investments in FTTH/B across the country. After reducing the prices of wholesale services from Openreach to encourage investments and competition in the market, Ofcom set out a plan to support full-fibre investment in July 2018. The plan follows the direction set in Ofcom’s 2016 Strategic Review of Digital Communications which is aimed at supporting the UK government’s ambition of 15 million homes to have access to full-fibre broadband by 2025.